The islands are nestled within the Exuma Sound which is actually a quite shallow body of water. Because of that the water retains a pool-like look to it and you can see starfish and sting rays swimming along the bottom. It's crystal clear. Also because giant ships can't pass through the shallow water there's practically zero wake. That means.........AMAZING paddle board potential. *Also means no cruise ships! 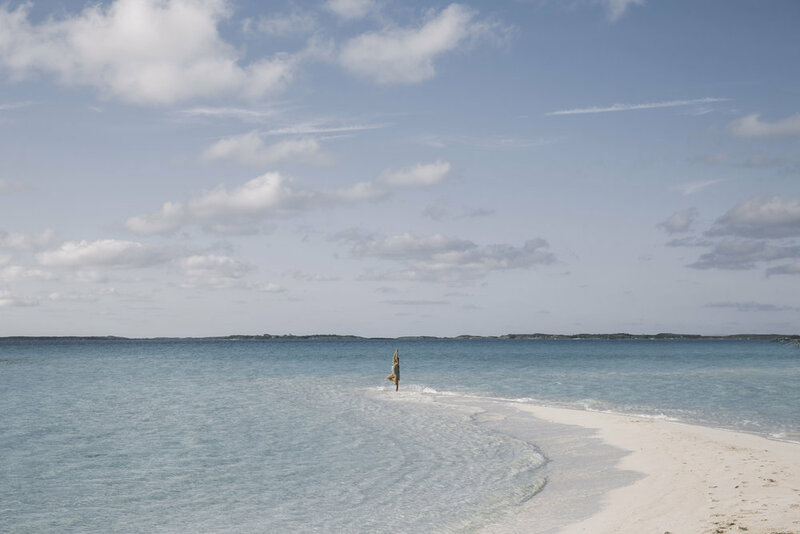 In the Exumas you sync with the tides. Low tide? 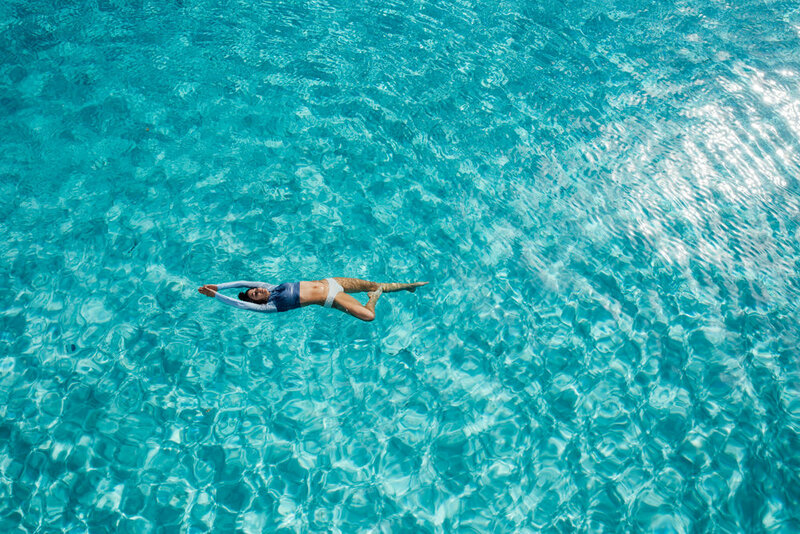 Take your small boat and find the nearest sandbar. Around here they get mighty beautiful. This is one of my favorites that located almost across from Major Cay where the pigs are located. I couldn't love anything more than wading through this water looking for sand dollars. 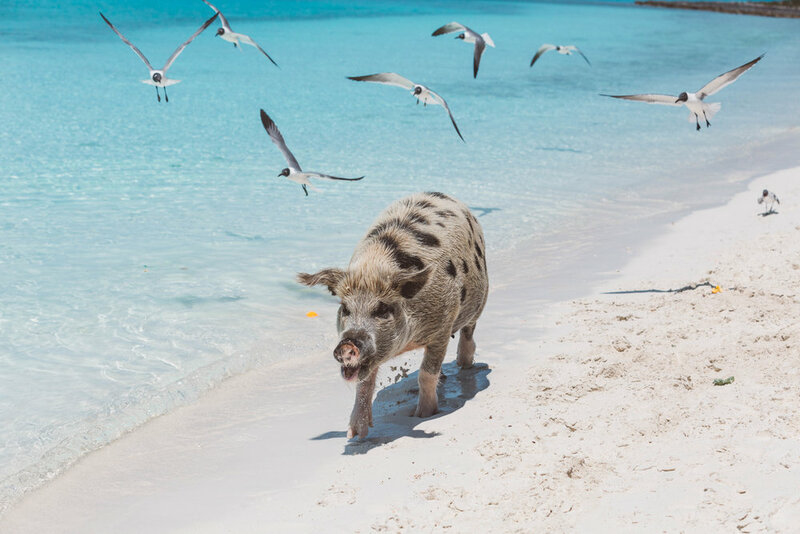 The Exuma Cays are famous for their sea creatures. 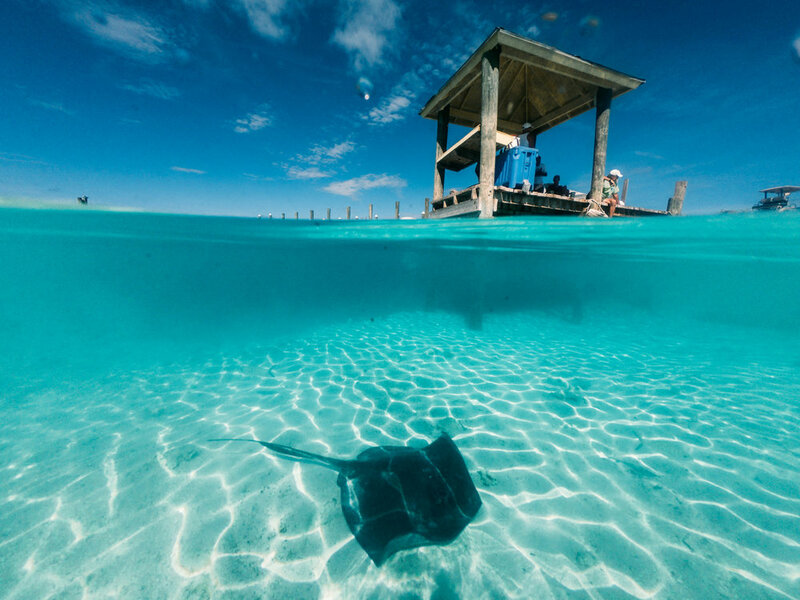 You'll see tons of sting rays, sea turtles,, aquatic pigs, starfish, and nurse sharks to start. That doesn't even include all of the fresh fish. We stumbled on the perfect beach to collect shells and sea fans. There must be something about the way the current carries debris that leads it all to this beach. It's easy to find though because it's most known for the hundreds of iguanas that inhabit the island. Most people go there for them but I would go back just for the goodies! I mean look at this hoard! Compass Cay- Famous for the docile nurse sharks that circle through the marina. You can get in with them and hang, if you're brave enough! Compass Cay was one of my favorites because you have this protected marina cove and then the other side of the island was a gorgeous crested beach. 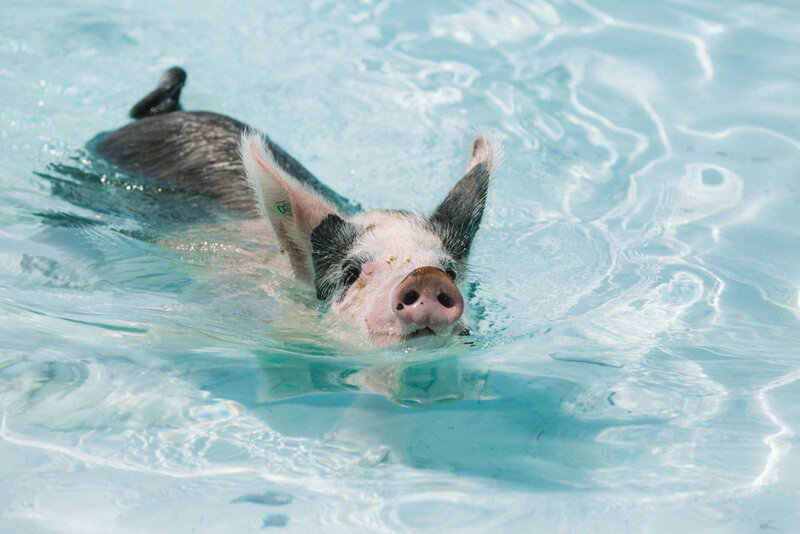 Major Cay- Technically they aren't marine life but they are the most aquatic piggies I've ever come across. You've probably seen these guys all over instagram. 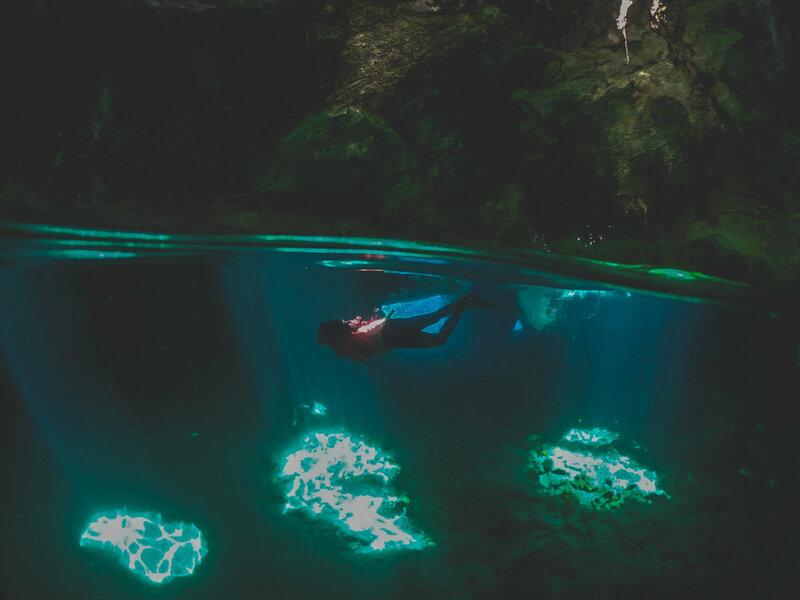 Thunderball Grotto- A hop skip and a jump by boat from Staniel Cay is this gorgeous natural anomaly of stone and water. They filmed an old James Bond movie here and it's recently been very found out about. You can swim into the grotto or jump into it if you're brave/crazy. It's a gorgeous place to spend some time and snorkel for fish. Farmer's Cay- These marina is tiny and remote but the locals will tear conch apart to get the sea turtles to come close to the docks. You can swim with them and the sting rays. I've had better experiences swimming with turtles in Tulum area. Here, you can't go out and swim with them, they try to come to you. Fly into Staniel Cay- You can use Watermakers Air from Ft Lauderdale. Or fly into Nassau and take Flamingo Air. Staniel Cay Yacht Club- Book in advance. Like, way in advance. These cottages are the most reasonable price wise and with the all-in package you get food AND a boston whaler to go out on adventures. Rent a Boat: This is the route we went this time. We stayed on a boat called Temptation run by our favorite Captain Joel! Can't recommend this crew enough! We slept under the stars every night from wherever we decided to dock. It was heaven. Over Yonder Cay- Ok if you have beaucoup bucks, like 40k a night, Over Yonder Cay is pretty legit. A private island with multiple private villas and a spa, it's as chic as it gets and as remote as it gets! Convinced yet? It meets my check list for places that not only take your breath away but allow you to breathe.